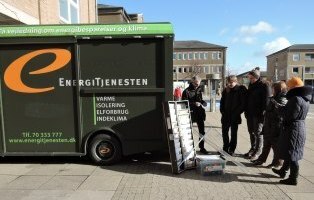 Mobile exhibition with posters and small hands-on demonstration sets on energy efficiency and renewable energy for buildings. 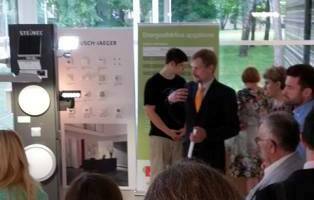 Six small exhibitions to be used in Russia and Belarus. 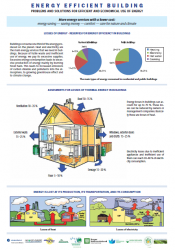 Posters on "Energy Efficiency in Buildings". Download the posters from the Friends of the Baltic's web site in English and in Russian. 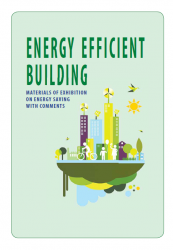 Booklet for NGOs and energy managers, "Energy Efficiency in Buildings". Download the Booklet from the Friends of the Baltic's web site in English and in Russian. 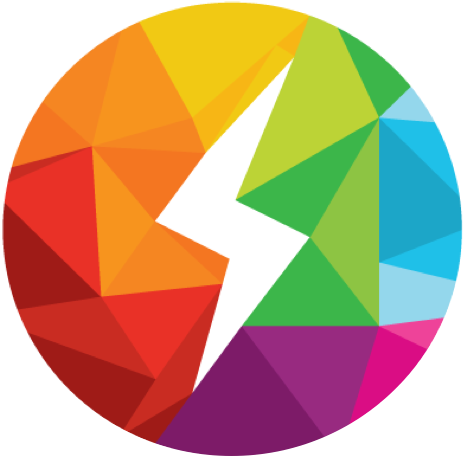 On-line course was developed and launched for Russian and Belarus energy advisers/managers of schools, offices, residential buildings, and local communities. Belarus article on the Course at CES's home page (in Russian). Article in newsletter "Sustainable Energy News" Issue No. 79 with contributions from the Partners, p. 4-6. Download the issue at SEN 79 pdf file. Participation on the impressive event "Bridge to the Future" on a sustainable transition of Norway. 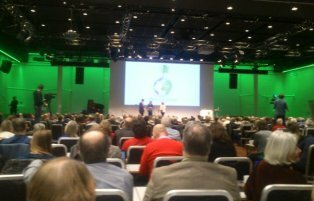 Read more on the Norwegian initiative "Bridge to the Future" and the Conference in Oslo in February 2016 (in Norwegian) including videos. Project planning meeting in Oslo in the office of FoE Norway. Meeting with Dag A. Hoystad from the Norwegian Society for the Conservation of Nature/FoE Norway and Gunnar Boye Olesen from INFORSE-Europe /SustainableEnergy, Denmark. Visiting >the office of the Environment and Energy Center in Hoeje Taastrup, Copenhagen. The center has advisory services on energy renovation, as well as several other initiatives like second hand shop, reparation services of technical equipments. 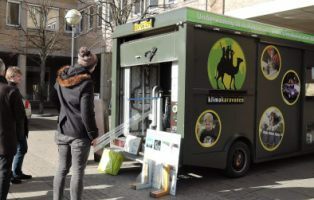 The mobile exhibition "Climate Caravan" visits schools and events. Presentation by Tommy Olsen, energy advisory office "Energitjenesten" Sjaelland. 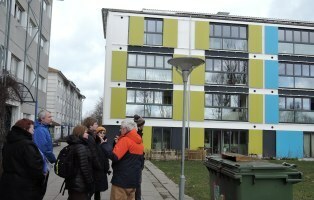 Visiting energy renovated houses in Hoeje Taastrup, Copenhagen. Guided Tour by the responsible persons at the housing association. Visiting the office of the Danish Energy Advisory Center "Energitjenesten" in Copenhagen. 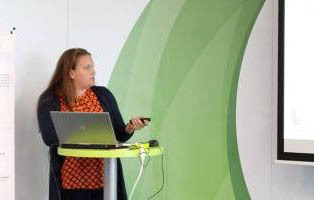 Presentation of the sustainable energy exhibition material and transportable box sets by Ann Vikkelsoe, Energitjenesten, Copenhagen Environment and Energy Office. 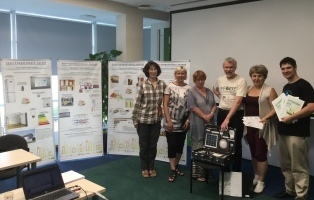 On June 27-28, 2016, the partners met again, this time in Latvia, to see the new mobile exhibition developed by the project, and discuss with Latvian NGOs and stakeholders the promotion of sustainable energy at a one-day Seminar. 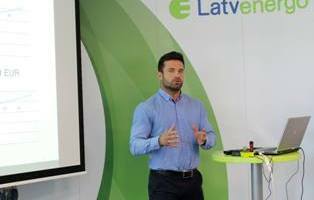 June 27, 2016, International Seminar: "Exchange of Experience among Baltic Sea Region NGOs and Society in Promotion of Energy Efficiency for Climate Protection and Local Development" at the Latvian Energy Efficiency Center "Latvenergo" in Jurmala, Latvia. 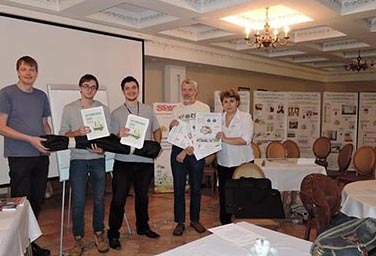 The Event was organised by the project partners of Latvian Green Movement (LaGM) and VAK in cooperation with INFORSE-Europe. by Andris Spidans, Latvenergo Energy Efficiency Centre. 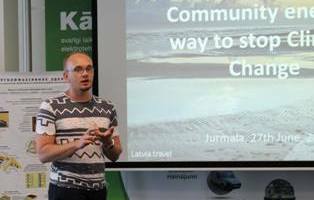 by Janis Artemjevs, Head of Environmental Department, Jurmala City Council Development Agency, Latvia. 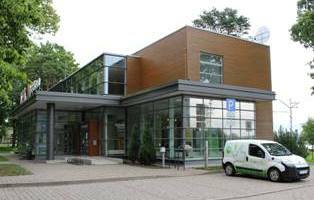 Introduction to the Jurmala City Sustainable Energy Action Programme 2013 to 2020. First progress report. by Lelde Braca, Strategic and Business Department, expert, Jurmala City Council Development Agency, Latvia. Download the Presentation pdf file, (2.1 MB). 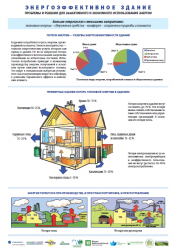 Energy Efficiency in the Buildings: problems, solutions, experience of Russian NGOs. by Olga Senova and Alexander Esipenok, Friends of the Baltic / Russian Social-Ecological Union. Download the Presentation (pdf file, 2.8 MB). 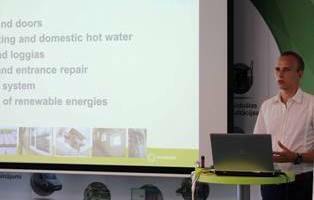 Danish Transition to Renewable Energy and the Important Role of Changing Building Energy Use. Download the Presentation (pdf file, 1,2 MB). 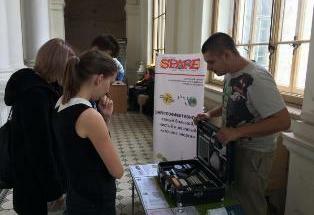 Promoting Building Energy Efficiency with Exhibitions, Information and Online Courses for Energy Managers, NGO. Local Authority Cooperation in the Baltic Sea Area. by Gunnar Boye Olesen, INFORSE-Europe, and the Project Partners. 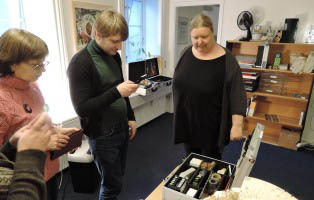 On the photo: The new mobile exhibition posters (to the left) and the box-set(to the right, front) with part of the project group in Latvia. Download the Presentation (pdf file, 2.9 MB). 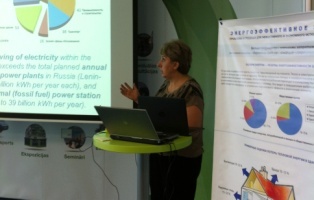 Local Energy and Climate Planning in Belarus. Cities, which develop such plans and join the Covenant of Mayors. by Dmitrij Burenkin, CES, Belarus. Download the Presentation (pdf file, 0.3 MB). 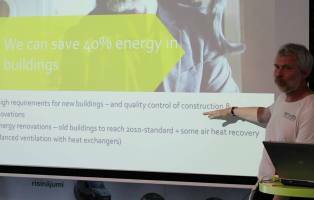 Multi-family Building Energy Efficiency in Latvia: Experience and Future Opportunities. Download the Presentation (pdf file, 1.9 MB). Different Experience Exchange by representatives of other NGOs, experts, citizens. Ikskile municipality experience by Kaspars Grinbergs. Download the Presentation (pdf file, 0.7 MB). Community Energy: Way to Stop Climate Change. Download the Presentation (pdf file, 0.6 MB). Final seminar conclusions, networking, and co-operation ideas for future in informal atmosphere. First presentation of the new mobile exhibition of energy efficient solutions for buildings at the Ecocentrum in St. Petersburg, Russia. 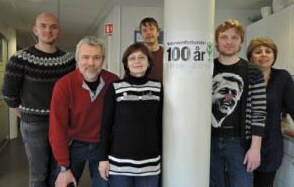 Read more at the Friends of Baltic's web site in English. 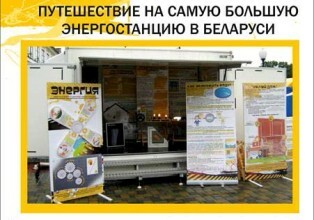 Exhibition and information stand about energy efficiency of building within the PoliFest - St. Petersburg Festival of Science, Environmentally Friendly Technology and Design. 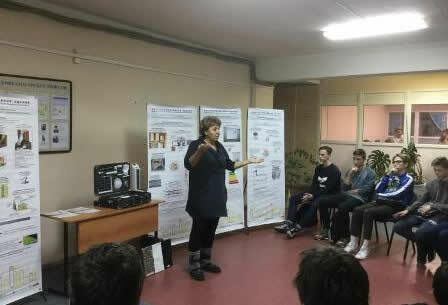 The study tour included visiting a new sustainable-energy exhibition in Minsk, which will be opened this year, and Braslav municipality, where the participants participated on an event towards an initiative "Braslav - the first climate-neutral municipality in Belarus". 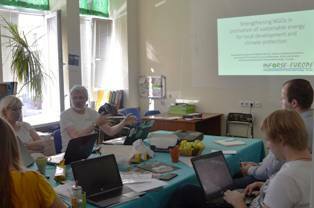 - Seminar in Minsk and climate-neutrality event in Braslav, where Gunnar Boye Olesen from INFORSE-Europe shared European experiences. - Seminar in Minsk on Friends of Baltic's web site in English and in Russian. September 30 - Seminar “Cities for life”, 30 participants (NGP leaders and activists), city authorities, partners from Ukraine (350.org). Organizer: Friends of the Baltic. Read more in English, and in Russian . October 1 - “Green Day”, city environmental festival, that include information actions about green cities, energy efficiency, green energy, sustainable development, etc. Organizer: St. Petersburg Polytechnic University. 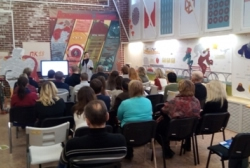 October 6 - International seminar on environmental education (Russia-Finland-Estonia), Participants were from state educational organizations (schools, children centers, universities) and NGO educators. 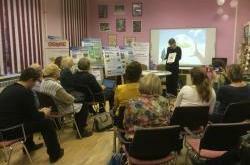 October 11, 2016 - Lomonosov, Russia - Series of exhibitions, lecturers in the framework of the ecological festival "Ecological lifestyle - common actions towards the Year of Ecology of the Russian Federation". Read more at the homepage of the Friends of Baltic in Russian. June 12 - Dzerzhinsk region, city fest on the central square. August 3 - Puchovichi region. school children camp in village school. October 17 - Dubrovno region. children and teachers. 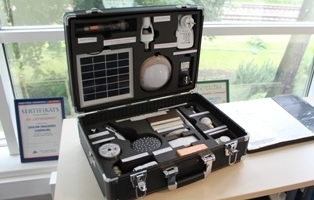 Energy saving in schools, the role of energy advisers at schools. 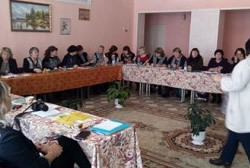 The teachers were from Dubrovno district. 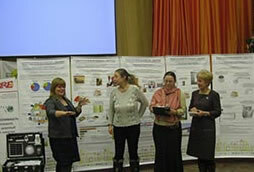 The Project was presented, the results - posters, booklet tool box - were exhibited and the online course was evaluated and discussed. 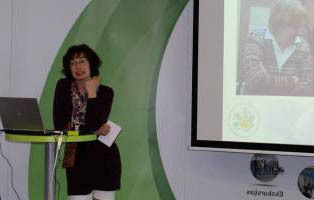 The participants included the Project Partners, and NGOs from all over Russia, city authorities, environmental experts. - "EU Trends in Energy Efficiency and Danish Experiences" by Gunnar Boye Olesen, INFORSE (pdf file, 0.6 MB). The conference adopted a Position Paper of Russian NGOs regarding the COP22 of the UNFCCC22 in Marrakesh, Morocco. 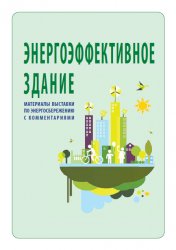 Read the Proceedings at the Russian Social Ecological Union's web site in English and in Russian. Building and construction related courses of the College of Tourism and Hotel service. Read more: English: and in Russian . Partners were represented at the Conference and its forum. INFORSE exhibition featured the latest Sustainable Energy News with article and front page of the Project. November 30, 2016, Russia. Seminar about results of COP 22 for civil society activists, with comments on the national low-carbon potential, and demonstration of exhibition as an illustration on one of the biggest potential of energy efficiency. 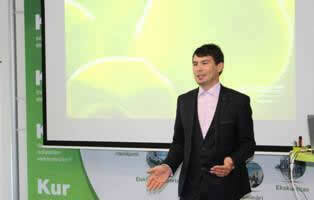 The course included the role of the energy advisers at schools, energy saving, and introduction on the online course. 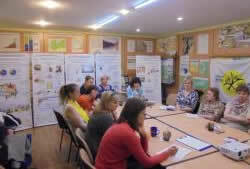 The teachers were from all regions of Belarus. Link: Article at CES's home page in Russian. Annual Final Meeting FoB and partners including school teachers, NGOs, representatives of the municipal authorities. 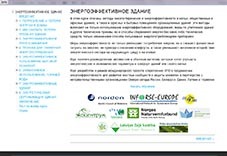 Partners are: INFORSE-Europe (coordinator), Latvian Green Movement (LaGM), Centre for Environmental Solutions (CES) in Belarus, Friends of the Baltic in St. Petersburg, Kola Environmental Center, and the Norwegian Association for Nature Protection. The Russian organisations are not participating in the budget allocations. 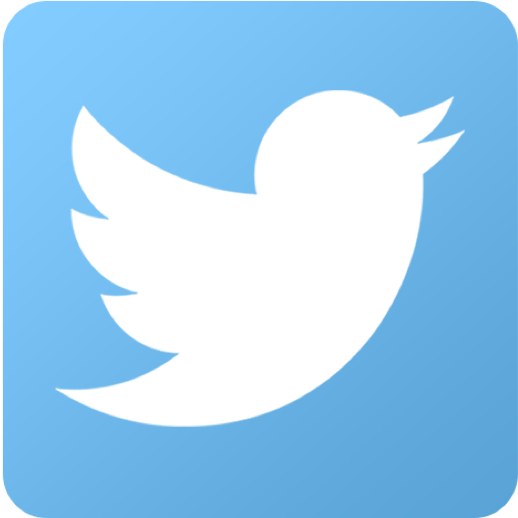 The Project is supported by the Nordic Council of Ministers.